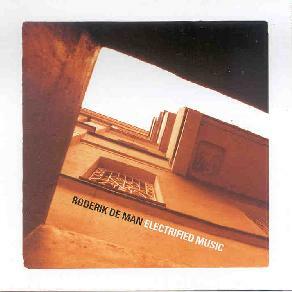 Roderik de Man - "Electrified Music"
Dutch academic and composer Roderik de Man's new CD on the Electroshock label is a collection of works recorded between 1988-2003. Most of the music was commissioned by various organizations and most combine instrumentation with tapes and electronics. Commissioned by the Amsterdam Fund for the Arts in 2002, "Sin Descanso" (without rest) combines blockflutes and tape samples to create a dramatic, multi-movement piece. The flutes are the lead instruments - wailing, fluttering and singing - backed by rising and falling ambient waves and thundering percussives, producing a theatrical orchestrated feel. "Dark Intervals" is a more purely electro-acoustic work composed in 2003 for a choreography by Sanna Myllylahti. The music consists of winding and pulsating soundscape textures, howling tonal colorations, percussion, voice and miscellaneous sounds that add variety and character to the piece. Once again there is a sense of dramatic urgency, which combined with the excellent sound and production makes this a challenging but relatively accessible avant-garde theater work. Composed in 1989 at the request of the European Wind Ensemble, "Air to Air" enlists flute, piccolo, bassethorn and trumpet, along with de Man's tapes which employ samples from the participating instruments. The result is a high intensity chamber ensemble theater piece, given a jolt into the experimental world by the tape work. "Chordis Canam" combines harpsichord and tapes, the harpsichord's unavoidable Baroque sound making this one of the more unusual and intriguing tracks of the set. Harpsichord and tape team up again for "Momentum", this time with the addition of bassclarinet, to create more of the albums more melodrama fueled moments. "Entanglements" combines recorders and tapes and is like a less dramatic and more whimsical version of "Sin Descanso". At little more than a minute in length, "Wait A Minute" drags the listener through a brief roller coaster video game ride. And finally, composed for tenor and tapes, "Czar Peter's Creation" is based on Alexander Pushkin's poem "The Bronze Rider". Intense ambient soundscapes and ethereal orchestrations make for a fascinating avant-garde symphony backing the vocals and narration. In summary, passionate compositions, electrifying performances and creative pairing of electronics and instrumentation make Electrified Music one of my favorites among the current batch of Electroshock releases. For more information you can visit the Roderick de Man web site at: http://www.roderikdeman.com. Email at: roderik@roderikdeman.com or rdeman@chello.nl. Electrified Music is distributed by Electroshock Records. You can visit their web site at: http://www.electroshock.ru.